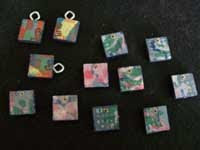 I've been thinking about this for awhile and finally got around to it .... making little pendants with my painted papers. 1) Grabbed a handful of the little wood tiles. 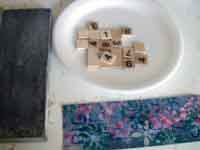 These are just under 3/4" square and are just like Scrabble Tiles, but with numbers. I don't recall what the game was they came out of. 2) Using my sanding block, lightly sanded the tile surfaces; just enough to rough up the surface. 3) Cut a section out of my 'painted papers'. 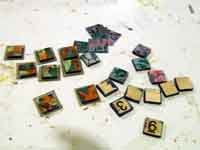 4) Cut 1" squares from the painted papers to create little paper tiles. 5) Applied my favorite adhesive, clear silicone caulk, to one side of the tile and put on the paper tiles, rubbing with an old credit card to make sure there were no air bubbles and let dry for about 15 minutes. 7) Turned over and repeated on reverse side. 8) After thoroughly dry, took outside and sprayed both sides with clear laquer. I would have preferred to paint with polyacrylic, but, at this size, was not quite sure how to accomplish that without have drips and a general unsightly mess. (I'll have to think about this some more). 9) Pulled out my smallest eye hooks to screw into the tops. This was not too successful as they are quite thin and all but 3 split. I'll probably try this again, but next time I'll drill a small starting tool .. this should help with the splitting issue. For the rest, just drilled a small hole (for a jump ring). Okay ... I like them. They are interesting, colorful and a great use for some of the painted papers I've made. I'm going to think about it for a couple days and perhaps try another variation and then make some up for general inventory. 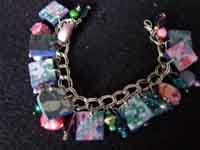 Using 9 of them, made up a charm bracelet, with about 18 bead charms, to see how they work out. I'm going to put it on in the morning and wear it, at least, a few days, to see how they hold up; ensure the papers stay intact, etc. etc. etc.